World History begins with prehistory and continues into the 21st century. 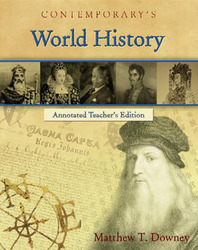 Incorporating both early world history and modern world history, this text offers a broad-reaching examination of the events that led to the world of today. Case studies provide teachers an opportunity to expand chapter topics and incorporate issues that face citizens around the world.